Insulation testers (also referred to as Megohmmeters or 'meggers') are a unique type of ohmmeters that are used to evaluate the electrical resistance of insulators. They are engineered to provide preventative maintenance and troubleshooting solutions for variety of different, high-voltage equipment applications. These applications include those for cables, switch gears, three-phase motors as well as any testing scenario that doesn't require breaking the circuit. A quality insulation﻿﻿ tester will be equipped to conduct the complete range of test voltages that are outlined in the IEEE 43-2000 and come with a CAT IV 600 V safety rating. 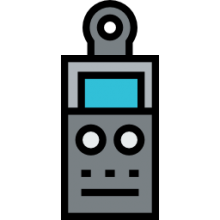 A solid Megohmmeter will be an ideal solution for troubleshooting, helping you to accurately identify and predict potential failures of equipment before they actually break down. Let's take a deeper look at 5 of the top-selling insulation testers. 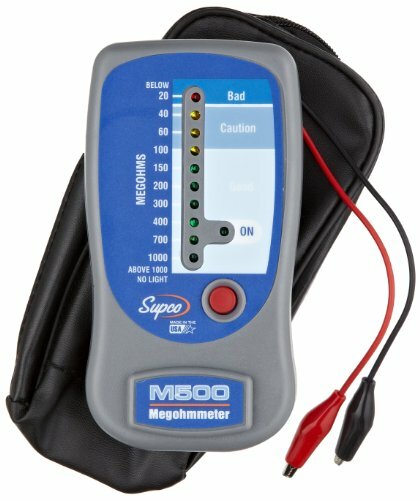 The 1 lb Supco M500 Insulation Tester and Electronic Megohmmeter is an inexpensive and handheld alternative to more expensive swing needle megohmmeters. It is equipped to provide insulation measurement values all the way up to 1000 megohms at 500 VAC. One user who works in commercial and industrial A/C installations, frequently meggs out motors and reports that the Supco is pretty accurate, though he does not advise that it be used for stuff bigger than 25 hp. He writes that it is exceptional for blower motors, small compressors etc., as well as for testing wiring in cases of what he calls intermittent electrical issues. Another consumer writes that you either are going to choose the Supco or the much more robust Fluke insulation tester. He also says he has used it primarily to get a sense of whether small motors have bad windings. An appliance repairman writes that he loves the Supco because it is exactly what he needs to do appliance repairs on washing machines, dryers, refrigerators and residential freezers. Additionally, he loves that he can refer to the digital display screen to demonstrate to his customers that a motor is failing or has failed- making him look much more professional. This is definitely the best value insulation tester for the money on the market today. Insulation testers are commonly for industrial units for preventative maintenance, quality control and troubleshooting electric motors typically in commercial settings. If you worked in a Toyota plant, for example, it would make a lot of sense to have an insulation tester in your toolbox available for diagnosing as well as replacing motor generators. Since every wire in your plant no matter whether it is located inside of a generator, cable, switch or transformer, it is assuredly covered with some sort of electrical insulation. In most cases of wiring, it is typically aluminum or copper because those are well-known excellent conductors of electrical current to enable you to provide sustained power to your industrial equipment. On the other hand, insulation is the exact opposite of a conductor- it needs to resist current and also ensure that the current is maintained along the path of the conductor. The one mathematical concept that you'll need to understand to truly appreciate how insulation testing works is Ohm's Law. This law basically describes the value of having highly resistant insulation against current. Good insulation basically means highly resistant. The value of an insulation tester is to check up on the quality of this resistance periodically. When first installed, electrical installation is in great quality. Over time, however, damage, excessive cold or heat, vibrations, corrosive elements, moisture or even just humidity can work to degrade the quality of insulation. In conjunction with the stress of electricity, insulation will deteriorate- they can be tiny holes or cracks. Moisture and foreign elements will then begin to infiltrate the surface of your insulation which will impair the resistance path of the current. Generally, in most cases, you will see the quality of resistance drop off pretty gradually, giving you a lot of time to correct the insulation resistance problem. In a minority of situations there can be a sudden depletion of resistance- this usually happens when your equipment is flooded. This is why, given how gradual the falloff usually is, there is so much value in doing periodic insulation testing to assess the quality of insulation in your equipment to prevent service failures. In the worst case scenario, if you are not doing routine insulation checks, a motor that has experienced deteriorated insulation could be incredibly dangerous for your workers to touch whenever voltage is applied to it or can actually burn out. In this case quality insulation has deteriorated to become an actual partial conductor. To summarize, good insulation will have high resistance where as poor insulation will provide low resistance. As well, resistance values can fluctuate if the temperatures are higher or lower or whether there is moisture in the insulation-this is because resistance will decrease in moisture or temperature. An insulation tester is a portable device that will provide you direct readouts of insulation resistance in ohms and megohms. It can be useful to visualize the insulation tester as essentially a higher-range resistance meter that contains a direct current generator. It is specially constructed to include voltage and current coils to provide true ohms that can be easily read and remain independent of the applied voltage. It's important to understand that the readings of insulation resistance should always be considered relative-you can experience fairly diverse readings from one motor or machine tested three consecutive days but that may not indicate poor insulation. What really matters is the trendline- which is to say, the trend of the readings over a specified time period that indicate deteriorating resistance. This will in turn indicate the potential for a breakdown and the need for some preventative maintenance. What Can You Expect When You Purchase A Megohmmeter? An insulation resistance tester is a type of electrical testing meter that is able to sense various properties of electrical circuits. These Megohmmeters can assess resistance, capacitance, continuity as well as current. Generally, they are available in a handheld or benchtop format, and come completely equipped to assess different sorts of equipment as well as power supplies. Generally they will ship with a bunch of different clamps, probes as well as leads that are used to make a connection between the meter and the circuit. For the most part, Megohmmeters will be safety certified based on the International Electrotechnical Commission standards for testing equipment that is of low - voltage. The IEC 61010 actually distinguishes between different over-voltage types of installation categories. Generally you will find that the Megohmmeters with a category 4 rating will offer you the best protection against transient voltages as compared to meters that possess lower ratings on this category scale. If you are looking to purchase an insulation tester and Megohmmeter, check out our comparison table above. We've also assembled some useful video content for you to examine prior to making an investment in a high-quality insulation resistance tester.